We need to set priorities for conservation because we cannot do everything, everywhere, at the same time. We determined priority areas for investment in threat abatement actions, in both a cost-effective and spatially and temporally explicit way, for the threatened mammals of the world. Our analysis presents the first fine-resolution prioritization analysis for mammals at a global scale that accounts for the risk of habitat loss, the actions required to abate this risk, the costs of these actions and the likelihood of investment success. We evaluated the likelihood of success of investments using information on the past frequency and duration of legislative effectiveness at a country scale. The establishment of new protected areas was the action receiving the greatest investment, while restoration was never chosen. The resolution of the analysis and the incorporation of likelihood of success made little difference to this result, but affected the spatial location of these investments. Figure 1. 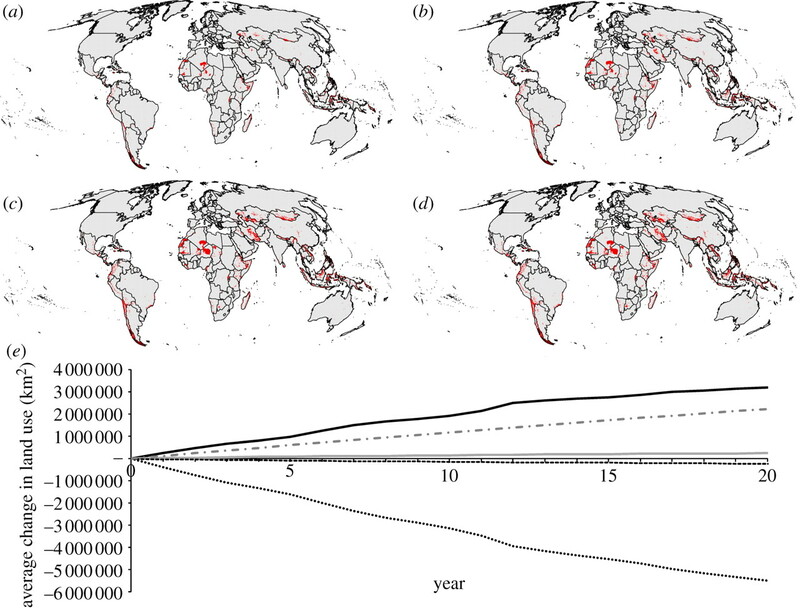 Spatial distribution of conservation funds through time at (a) 5, (b) 10, (c) 15 and (d) 20 years for all conservation actions, and (e) the average change in land use through time. Restoration received no investment after 20 years. Black solid line, protected areas; grey line, reduced impact logging; black dashed line, forestry; black dotted line, unallocated; grey dashed-dotted line, agriculture.